The objective of Subtask A1 is to supply the tools necessary for assessing the quality level of the sorption chillers installed in solar cooling plants. Particular attention has been given therefore to all those methods able to characterize the chillers at off-design conditions and during the transitory phases typical for these kind of applications. With this regard, two test procedures aimed at the “mapping” of the chillers at full load and at partial load and able to provide specific provisions on the basis of their operation (i.e. continuous and discontinuous) have been developed. 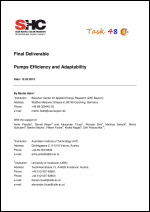 The expected result is to achieve reliable data, coming from laboratory tests, that can be used as input for calculation methods for the seasonal performance evaluation of the chillers, like the BIN METHOD, or as input for the development of numerical models able to simulate their behavior on annual basis within specific boundaries. For their drafting, the testing protocols available on the dedicated normative scenario and according to the current criteria of the Eco-design and the Eco-labeling directives have been used as reference. The present final report deals with these two test procedures and includes the approach used for their drafting, the description of the test protocols in terms of rating conditions, testing methodology and the testing apparatus, and the results obtained from the first attempt of validation of the developed test procedures. 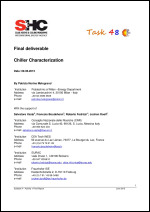 SHC Task 48 Subtask A concentrates on developing tools and deliverables to show the level of quality of the most critical components of the solar cooling and heating system. These components are mainly the chiller, the heat rejection device, the pumps and the solar collectors. 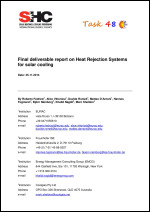 This report gives an overview of existing and novel concepts for heat rejection devices in solar cooling systems and recommendations on which heat rejection measure should be used under different boundary conditions (climate, system concept etc.) while achieving the 2 main objectives: 1) investment & operation costs minimization 2) re-cooling performance and efficiency. For selected components, where it was possible, a performance characterization has been made in partnership with manufacturers.